Britta Meredith is a PhD candidate (ABD) and Teaching Assistant at the University of Connecticut. Her dissertation research is on Vilém Flusser’s Rhizomatic Writings of the Self. She received the Award for Outstanding Achievements in the Study of German in her MA (2013) and PhD (2015) from the Consulate General of the Federal Republic of Germany (Boston), as well as the Award for Excellence in Teaching from the University of Connecticut in 2016. 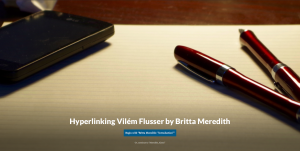 Moreover, Britta received the Borys and Linda S. Bilokur Award in Eastern European Studies (2018) for her dissertation research on the Czech-born author, writer and philosopher Vilém Flusser. She is Co-Editor of Flusser 2.0 (2016-present) and UConnGerman (2018-present), and elected Student-Faculty Liaison for the German Section (2015-present). Since 2018 she has been the Multimedia Language Center Coordinator in the Department of Literatures, Cultures and Languages, and in addition has volunteered as cultural ambassador for the Goethe Institute Boston. She was an Advisor of the German Language and Cultural Society (2017-2018) and from 2015-2018 she co-organized the German Studies Colloquium. In the fall 2018 Britta Meredith participated as an instructor in the pilot project “After-School German Language and Culture”, a collaboration between the Goethe Institute Boston and the University of Connecticut. 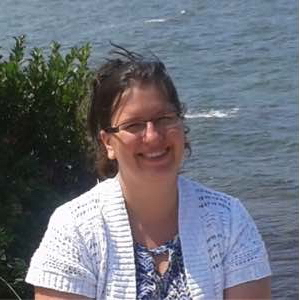 In 2014 she held the position of part-time Faculty at Quinnipiac University. She presented on topics related to her PhD research at major conferences such as NeMLA (Hartford, CT; 2016), TTT (New York City, NY; 2016) and GSA (Atlanta, GA; fall 2017). 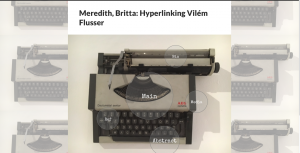 environment in which users may work with, compare and analyze the original manuscript of Vilém Flusser’s 1989 essay Schreiben für elektronisches Publizieren in various forms, while being able to join a scholarly discourse on, with and through the text. Her projects intend to stimulate communication between disciplines, try to open new avenues of research, and aim to increase collaboration of researchers from various disciplines and fields of study. Appropriately, her latest publication “Social Justice in Beginning Language Instruction: Interpreting Fairy Tales” (Dimensions Special Issue 2018) was written in collaboration with Manuela Wagner et al. 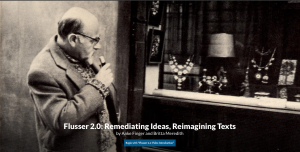 Furthermore, she serves as co-editor with Anke Finger of Flusser 2.0: Remediating Ideas, Reimagining Textsa multimodal collection composed with Scalar. 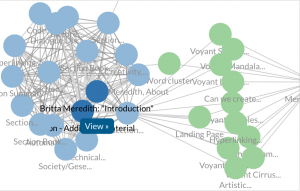 The purpose of this project is to use a multimodal platform, Scalar, to generate digital modes of scholarship, beyond print and linear formats, allowing for multiple sensory perceptions and exploring how thoughts or ideas are structured and organized in multimodal communication. Correspondingly, Britta Meredith’s early work (Focus on German Studies Vol. 23, 2016) takes a closer look at senses and sensory perceptions in the 20th century novel Kleiner Mann, was nun? (1932).